Anyone who knows me knows I have a massive blind spot when it comes to DC in general. I don’t usually find their characters particularly compelling and have always been apprehensive about getting too invested in that universe because I feel rebooting just feels like pulling the rug out from under people. But I’ve been trying to work through the some of material that many people say are high watermarks for the company. For example, I’ve been working my way through Mark Waid’s Flash run (which I’m sure I’ll review at a later time). 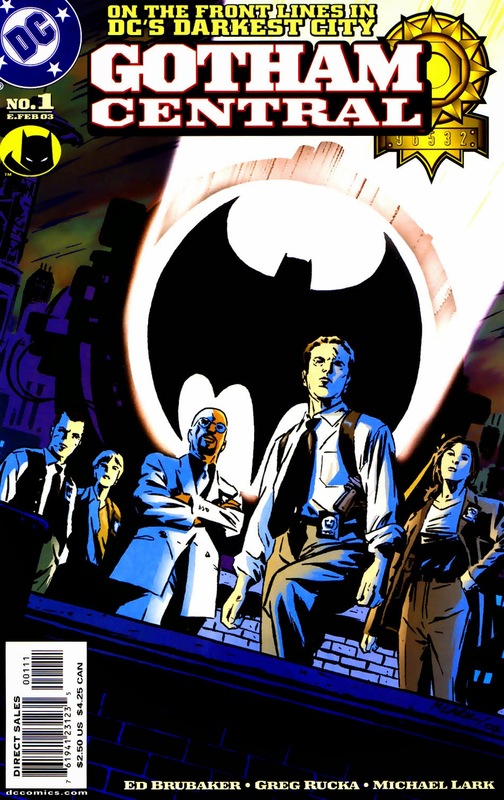 For now, I’m reviewing Gotham Central for two reasons: One, I’ve heard nothing but good things about it over the years and Two, Rucka has never failed me as a creator. Brubaker has been strong as well, if we ignore his X-men work. I’m going to try to be as spoiler free as possible because I wouldn’t want to ruin anything in this series for anyone. Some of the points I’ll be making may come across as gross generalizations, so please bear with me. Why did I throw this quote in here, you ask? I imagine this had to be how Rucka and Brubaker must have felt after writing this series. Where could they possibly go from here? Would they ever be able to top this? Granted, both men did move on to some wonderful projects (Brubaker to Captain America and Rucka to Wolverine, for example), but this could have been their drop-the-mic moment. They could’ve stopped here and called it a day. Mind you, the art in this series was fantastic, the writing is the true star. This series reads like a police procedural that you would have seen Thursday nights on NBC back in the day, like a Law & Order and the like. At first, the cast seems so large that you’ll never get your head around who they all are and what’s going on. But this passes and you soon fall in love with each of them. You learn their relationship dynamics with their partners and their other co-workers on the force. Some of the character arcs force you to really become invested in some of them and you’ll want to know what’s going to happen to them next! Throughout, we see these officers martyred, we see some go corrupt, and we see others go through a redemption of sorts. One of the finest examples of how strong the writing is in this series is how they handle one of the officers being outed as a lesbian. Rucka and Brubaker tackle this subject with such a maturity that I can do nothing but applaud such a fine effort. Another excellent example of the writer’s range comes in my favorite arc of the series, Soft Targets. In this arc, it’s a taut, fast-paced thriller that evokes thoughts of movies where there’s a race to stop a killer before the body count gets too high. As I’ve briefly mentioned before, the art is no slouch either. Michael Lark is among the modern masters in panel layouts and storytelling, right up there with the likes of Gabe Hardman and Darwyn Cooke. Each panel looks exactly like a shot that you would see if this was a movie or tv show. He eventually leaves the book, but he leaves it in capable hands. Artists such as Kano and Steve Leiber do a phenomenal job picking up the reigns and continuing the story. The verdict: My absolute highest recommendation. This series is one of the best I’ve read in years and I almost want to kick myself for not checking it out sooner. Everything about it is absolutely top-notch. Be warned though: you will come to love the characters in this book and the final arc is heartbreaking. If I ever did a “Top 5 gut-wrenching moments in comics” article, this would be on it. It leaves you feeling sad and angry at the same time. When a comic can bring out such a visceral reaction in its readers, you know it’s good! The score: 5 out of 5 stars.